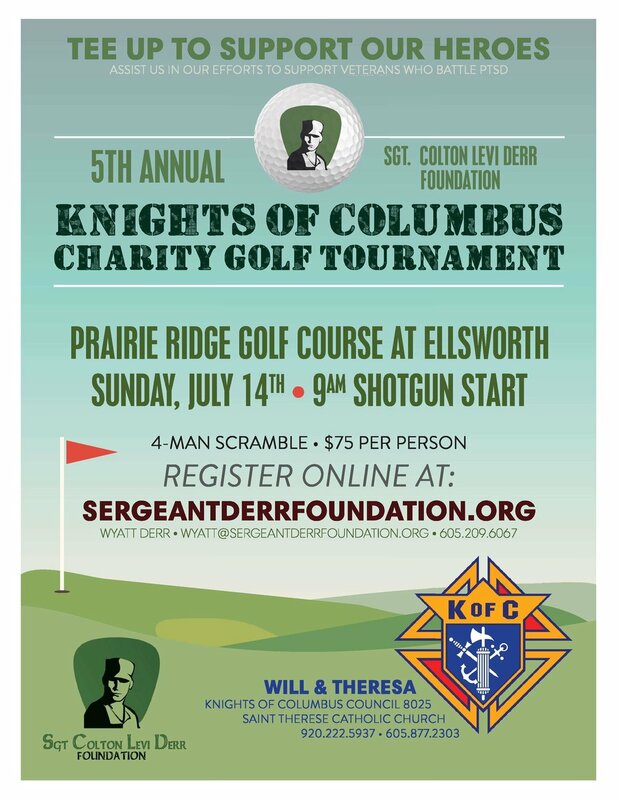 Sergeant Colton Levi Derr Foundation (SCLDF) announces its participation in the Knights of Columbus St. Therese Council 8025 charity golf tournament in support of veterans on Sunday, July 14, 2018. Please register by filling out the form below. Only one member from each team will need to complete the registration form. 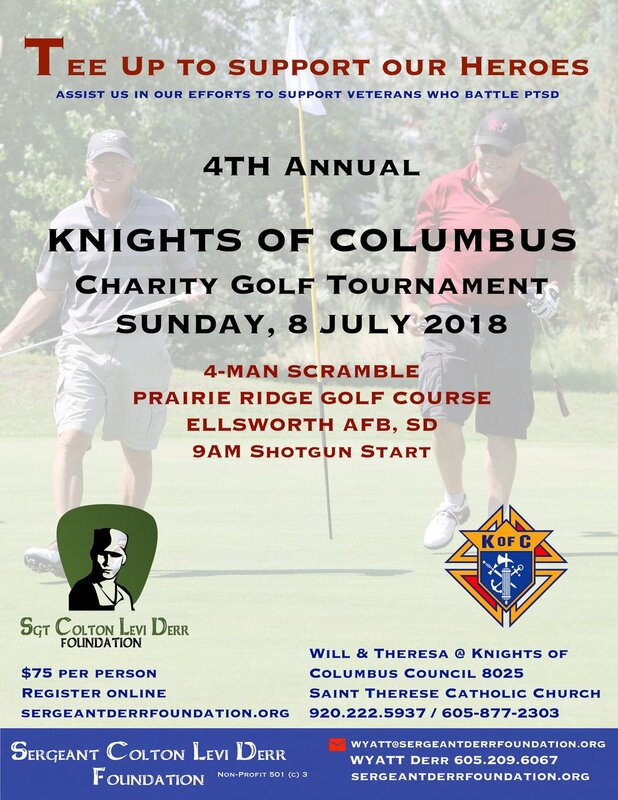 Please make all checks payable to Knights of Columbus Council 8025 and mail them to 518 6th Street STE 2, Rapid City, SD 57701. Or notate in the message field if you would like to pay with cash or another method, and we will work out arrangements with you. We look forward to having you join us! We invite you to our annual Gala in support of Veterans on Saturday, 19 October 2019. Help us raise awareness about the issues facing our warriors: Post Traumatic Stress Disorder (PTSD), Traumatic Brain Injury (TBI), veteran suicide, homelessness, multiple deployments and the effect they have on our veterans and their families. Veterans from the Black Hills area will be in attendance and your presence and community support will be met with much respect. Please come join us for our annual walk/run! Registration starts at 7:30 am at the McDonald's Free Stage at the Central States Fair Grounds. Registration is $30 per person and everyone will receive a free t-shirt. You can also pre-register by following the link down below. We look forward to seeing you there! 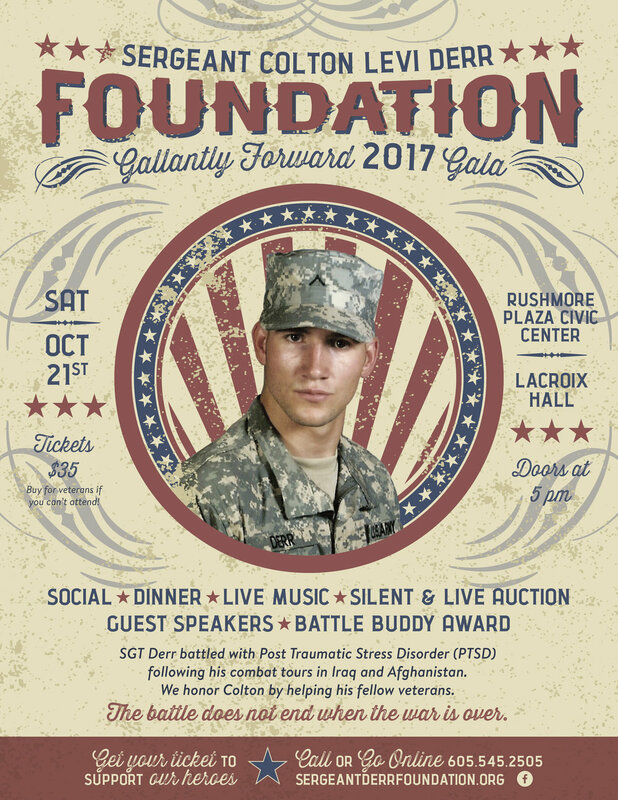 We invite you to our annual Gala in support of Veterans on Saturday, 21 October 2017. Help us raise awareness about the issues facing our warriors: Post Traumatic Stress Disorder (PTSD), Traumatic Brain Injury (TBI), veteran suicide, homelessness, multiple deployments and the effect they have on our veterans and their families. Veterans from the Black Hills area will be in attendance and your presence and community support will be met with much respect. Please come join us for our annual walk/run! This year we will only be doing a 5K walk/run. Registration starts at 7:30 am at the Free Stage at the Central States Fair Grounds. Registration is $30 per person and everyone will receive a free t-shirt. We look forward to seeing you there! Please join us on 22 OCT for our GALA! If you can't attend - please consider buying a ticket to sponsor a veteran. Former U.S. Army Captain Neil Fotre will carry the message of HOPE as our main speaker. This event will be held on Sunday, September 18, 2016 at Founders Park downtown Rapid City, SD. Registration will begin at 8am sharp and the walk/run will begin at 9am. Awards and prizes to follow. Entry fee is $20 per person. You can pre-regisiter online or at the time of the event. Payment will be accepted at time of event. We will be at the Black Hills Stock Show in Rapid City, SD on January 30 - February 8th, 2015. Stop in and visit our public awareness booth.